آیتی, بیتا, رضائی, مینا. (1395). قابلیت سیستم SBAR در حذف متیل ترشیاری بوتیل اتر: مشخصات بیوگرانول‌ها. مجله آب و فاضلاب, 27(6), 50-58. 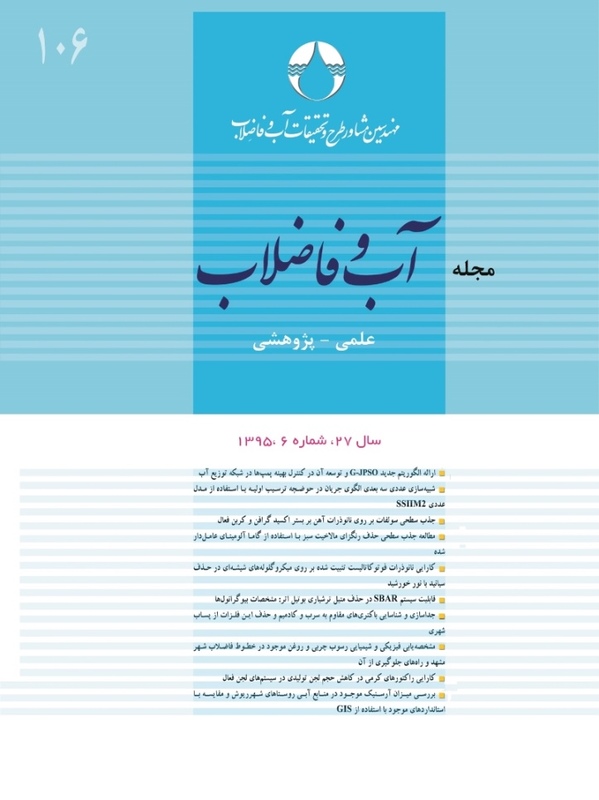 بیتا آیتی; مینا رضائی. "قابلیت سیستم SBAR در حذف متیل ترشیاری بوتیل اتر: مشخصات بیوگرانول‌ها". مجله آب و فاضلاب, 27, 6, 1395, 50-58. آیتی, بیتا, رضائی, مینا. (1395). 'قابلیت سیستم SBAR در حذف متیل ترشیاری بوتیل اتر: مشخصات بیوگرانول‌ها', مجله آب و فاضلاب, 27(6), pp. 50-58. آیتی, بیتا, رضائی, مینا. قابلیت سیستم SBAR در حذف متیل ترشیاری بوتیل اتر: مشخصات بیوگرانول‌ها. مجله آب و فاضلاب, 1395; 27(6): 50-58. افزایش مصرف MTBE به‌عنوان جانشین تترا اتیل سرب و آثار سوء آن بر محیط زیست، تصفیه فاضلاب حاوی آن را ضروری می‌نماید. با وجود کاربرد روش‌های فیزیکی و شیمیایی برای حذف MTBE، به دلایلی ازجمله هزینه‌بر بودن، تولید محصولات جانبی و راندمان کم، روش بیولوژیکی می‌تواند جایگزین مناسبی باشد. هدف از این تحقیق، بررسی قابلیت سیستم SBAR و بیوگرانول‌های هوازی در حذف ترکیب MTBE بود. فاضلاب به‌کار رفته سنتزی و شامل مواد مورد نیاز میکروارگانیسم‌ها بود. pH در محدوده 7 تا 8 و DO بین 2 تا 5 میلی‌گرم در لیتر تنظیم شد. برای بررسی مشخصات گرانول‌های تولید شده از TEM استفاده شد. نتایج حاصل بیانگر حذف بالغ بر 90 درصد COD اولیه 500 میلی‌گرم در لیتر پس از چهار ساعت بود که 28 و 5/1 درصد آن به‌ترتیب مربوط به نقش مکانیسم عریان‌سازی و جذب سطحی بود. گرانول‌های تشکیل شده رنگ قهوه‌ای، اندازه 2تا 6میلی‌متر، متوسط سرعت سقوط 65/0 سانتی‌متر بر ثانیه و دانسیته 055/0 گرم در میلی‌لیتر داشتند که بالاتر از فلوک‌ها بوده و درنتیجه فرایند ته‌نشینی در راکتور بهبود یافت. طبق نتایج حاصل از TEM،گونه‌های سیلیاته و روتیفر جمعیت غالب در گرانول‌ها را تشکیل می‌دادند. The growing use of MTBE as a substitute for Tetraethyl lead and its adverse impacts on the environment warrant its removal from wastewater. Given the low efficiencty and the high cost associated with the chemical and physical processess commonly used for the removal of MTBE, which also release hazardous by-products into the environment, biological techniques have been explored as the more appropriate methods for its removal. This research seeks to investigate the feasibility of the SBAR system and aerobic biogranules for MTBE removal. For this purpose, a synthetic wastewater containing the materials needed for the microorganisms was used for the experiments and the pH level and DO were set to 7‒8 and 2‒5 mg/L, respectively. TEM was employed to characterize the granules. Results showed that over 90% of the initial COD (500 mg/L) was removed after 4h, which was attributed to the air stripping (28%) and sorption (1.5%) mechanisms. The resulting granules were brown in color, 2‒6 mm in size with a mean fall speed and a density equal to 0.65 cm/s and 0.055 g/ml, respectively. The superiority of the resulting granules to the flocs led to improved sedimentation in the reactor. Finally, TEM investigations showed that the sylyath and rotifer species formed the dominant populations in the granules. 1. Aivalioti, M., Despina, P., Panagiotis, P., and Evangelos, G. (2012). “Removal of BTEX, MTBE and TAME from aqueous solutions by adsorption onto raw and thermally treated lignite.” J. Hazardous Material, 207-208, 136-146. 2. Adave, S.S., Lee, D-J., and Lai, J-Y. (2009). “Treating chemical industries influent using aerobic granular sludge: Recent Development.” J. the Taiwan Institute of Chemical Engineers, 40, 333-336. 3. Beun, J.J., Hendriks, A., van Loosdrecht, M.C.M., Morgenroth, E., Wilderer, P.A., and Heijnen, J.J. (1999). “Aerobic granulation in a sequencing batch reactor.” J. Water Research, 33 (10), 2283-2290. 4. Baus, C., Sona, M., and Brauch, H.J. (2007). “Ozonation and combined ozone/H2O2, UV/ozone and UV/H2O2 for treatment of fuel oxygenates MTBE, ETBE, TAME, and DIPE from water — acom- parison of removal efﬁciencies.” J. Water Sci. Technol., 55, 307-311. 5. Gogate, P.R., and Pandit, A.B. (2004). “A review of imperative technologies for wastewater treatment II: Hybrid methods.” J. Adv. Environ. Re., 8, 553-597. 6. Mehrjouei, M., Siegfried, M., and Detlev, M. (2014). “Catalytic and photocatalytic ozonation of tert-butyl alcohol in water by means of falling film reactor: Kinetic and cost-effectiveness study.” J. Chemical Engineering, 33(14), 521-528. 7. Nien Wua, T., Ting-Chung, P., and Lung-Chuan, C. (2012). “Electrophotocatalysis of aqueous methyl tert-butyl ether on a titanium dioxide coated electrode.” J. Electrochimica Acta, 86, 170-176. 8. Safari, M., Manouchehr, N., and Mitra, D. (2013). “Photocatalytic degradation of methyl tert-butyl ether (MTBE) by Fe-TiO2 nanoparticles.” J. Industrial and Engineering Chemistry,19, 1697-1702. 9. Mohebali, S. (2013). “Degradation of methyl t-butyl ether (MTBE) by photochemical process in nanocrystalline TiO2 slurry: Mechanism, by-products and carbonate ion effect.” J. Environmental Chemical Engineering, 1, 1070-1078. 10. Hutson, A., Saebom, Ko. Sc., and Huling, G. (2012). “Persulfate oxidation regeneration of granular activated carbon: Reversible impacts on sorption behavior.” J.Chemosphere, 89, 1218-1223. 11. Deng, D., Libin, P., Mengyun, G., and Yuan, K. (2014). “Impact of activation methods on persulfate oxidation of methyi tert-butyl ether.” J. Hazardous Materials, 264, 521-528. 12. Irina, L., and Amit Bhatnagar, M. S. (2014). “Overview of technologies for removal of methyl tert-butyl ether (MTBE) from water.” J. the Total Environment, 476-477, 415-433. 13. Zadaka-Amir, D., Ahmed, N., Shlomo, N., and Yael, G.M. (2012). “Removal of methyl tertiary-butyl ether (MTBE) from water by polymer–zeolite composites.” J. Microporous and Mesoporous Materials, 151, 216-222. 14. Zaki, S., Seddigi, A.B., Shahid, P., Ansari, S. A., Ahmed, E. Y., Danish, N. H., and Yarkandi, S.A. (2014). “Preparation and characterization of Pd doped ceria–ZnO nanocomposite catalyst for methyl tert-butyl ether (MTBE) photodegradation.” J. Hazardous Materials, 264, 71-78. 15. Redding Adam, M., and Fred, S.C. (2014). “The role of mesopores in MTBE removal with granular activated carbon.” J. Water Research, 255, 511-515. 16. Hwang, S., Scott, G., and Huling, S. (2010). “Fenton-like degradation of MTBE: Effects of iron counter anion and radical scavengers.” J. Chemosphere, 78, 563-568. 17. Babuponnusami, A., and Muthukumar, K. (2014). “A review on fenton and improvements to the fenton process for wastewater treatment.” J. Environmental Chemical Engineering, 2, 557- 572. 18. Li, W., Yong, W., and Angelidaki, I. (2014). “Effect of pH and H2O2 dosage on catechol oxidation in nano-Fe3O4 catalyzing UV–Fenton and identiﬁcation of reactive oxygen species.” J. Chemical Engineering, 244, 1-8. 19. Olmos, R., Gonzalez, U., Roland, H., Toufar, F.D., and Kopinke, A.G. (2009). “Fe-Zeolites as catalysts for chemical oxidation of MTBE in water with H2O2.” J. Environmental, 89, 356-364. 20. Keller, A.A. (2000). “Cost and performance evaluation of treatment technologies for MTBE-contaminated water.” J. Chemical Engineering, 17(4), 245-259. 21. Qiang, K., Jian, Z., HuuHao, N., Shouqing, N., Rongshu, F., and Wenshan, G. (2013). “Nitrous oxide emission in an aerobic granulation sequencing batch airlift reactor at ambient temperatures.” J. Biodeterioration and Biodegradation, 3, 1-6. 22. Torregrossa, M., and Bella Gaetano, D. (2013). “Simultaneous nitrogen and organic carbon removal in aerobic granular sludge reactors operated with high dissolved oxygen concentration.” J. Bioresource Technology, 142, 706-713. 23. Thanh, B.X. (2005). “Aerobic granulation coupled membran bioreactor.” MSc Thesis, Ho Chi Minh City University of Technology, Thailand. 24. Taheri, E., Khiadani, M., Amin, H., Nikaeen, M., and Hassanzadeh, C.A. (2012). “Treatment of saline wastewater by a sequencing batch reactor with emphasis on aerobic granule formation.” J. Bioresource Technology, 111, 21-26. 25. Sirros Rezaei, L., and Ayati, B. (2012). “Cultivation of aerobic granules in a novel configuration of sequencing batch airlift reactor.” J. Environmental Technology, 33(20), 2273- 2280. 26. Moussavi, G., Barikbin, B., and Mahmoudi, M. (2010). “The removal of high concentration of phenol from salin wastewater using aerobic granular SBR.” J. Chemical Engineering, 158 (3), 498-504. 27. Bao, R., Shuili, Y., Wenxin, Sh., Xuedong, Z., and Yulan, W. (2009). “Aerobic granules formation and nutrients removal characteristics in sequencing batch airlift reactor (SBAR) at low temperature.” J. Hazardous Material, 168 (2-3), 1334-1340. 28. Li, N., Ly, Z., Zhang, T., and Wang, X. (2010). “Granulation of filamentous microorganisms in a sequencing batch reactor with saline wastewater.” J. Environmental Sciences, 22 (1), 62-67. 29. Wang, S.G., Liu, X.W., Zhang, H.Y., Gong, W.X., Sun, X.F., and Gao, B.Y. (2007). “Aerobic granulation for 2, 4- dichlorophenol biodegradation in a sequencing batch reactor.” J. Chemosphere, 69 (5), 769-775. 30. Eduardo, I., María, E., Suárez,O., Ángeles, V.R., Nicolás, M., Julio, P., and Julián, C. (2012). “Long term operation of a granular sequencing batch reactor at pilot scale treating a low-strength wastewater.” J. Chemical Engineering, 198-199, 163-170. 31. Ghadri, F., Ayati, B., and Ganjidoust, H. (2011). “Role of MBBR and SBR in biological degradation of formaldehyde wastewater.” J. Environ. Health Sci. Eng., 8(4), 295-306. 33. Muda, K., Aris, A., Salim, M.R., Ibrahim, Z., Yahya, A., van Loosdrecht, M.C.M., Ahmad, A., and Nawahwi, M.Z. (2010). “Development of granular sludge for textile wastewater treatment.” J. Water Research, 44 (15), 4341-4350. 34. APHA., AWWA., WEF. (2012). Standard methods for the examination of water and wastewater, 22nd Ed., USA. 35. Xia, S., Li, J., Wang, R., Li, J., and Zhang, Z. (2010). “Tracking composition and dynamics of nitriﬁcation and denitriﬁcation microbial community in a bioﬁlm reactor by PCR-DGGE and combining FISH with ﬂow cytometry.” J. Biochemical Engineering, 49 (3), 370-378. 36. Baloch, M.I., Akunna, J.C., Kierans, M., and Collier, P.J. (2008). “Structural analysis of anaerobic granules in a phase separated reactor by electron microscopy.” J. Bioresource Technology, 99 (5), 922-929. 37. Smolders, G.J.F., Klop, J., van Loosdrecht, M.C.M., and Heijnen, J.J. (1995). “A metabolic model of the biological phosphorus removal process. I. Effect of the sludge retention time.” J. Biotechnol. Bioeng., 48, 222-233. 38. Kariminik, A., Amini, J., and Saeidi, K. (2013). “Biodegradation of methyl tert-butyl ether by isolated bacteria from contaminated soils to gasoline.” J. Applied and Basic Sciences, 5 (12), 1566-1569. 39. Najafi, S. A. (2014). “Removal of petrolium contaminant using microorganisms.” J. Scientific Exploration and Production of Oil and Gas, 110, 27-31. (In Persian). 40. Yue Ma, D., Hua Wang, X., Song, C., Guang Wang, S., Hong Fan, M., and Ming Li, X. (2011). “Aerobic granulation for methylene blue biodegradation in a sequencing batch reactor.” J. Desalination, 276, 233-238. 41. Fernandez, I., Eugenia Suárez, M., Julio Pérez, O., and Carrera, J. (2013). “Aerobic biodegradation of a mixture of monosubstituted phenols in a sequencing batch reactor.” J. Hazardous Materials, 260, 563-568.